Big Hit's hip hop boy group BTS (a.k.a Bulletproof Boy Scouts/방탄소년단/Bangtan Boys) which consists of members: Rap Monster, Jin, SUGA, J-Hope, Jimin, V and Jungkook. At last, I have found the group of intellectuals. Ah...So many members, BTS is popular everywhere you go. who's going to the concert? @AegyoQueen7 yeah, I did. Don't Leave Me has me addicted<3 HELLO FAM! Anyone listened to the new songs on the new album? Hello! 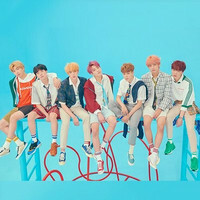 I am surprised I found a BTS group on my favorite anime site!